Standard Delivery is U.S. Mail or UPS Ground in the U.S.; or Air Mail for International orders. Please allow 1-4 weeks for standard shipping. We always do our best to fulfill orders as quickly as possible, and there's a very good chance you'll receive yours sooner than that.... but we do ask that you allow up to four weeks for standard shipping. Expedited Shipping is available to U.S. destinations. Customers requesting Overnight or 2-Day service should have delivery within, respectively, one or two business days from when we received your order. Expedited orders received after 2 p.m. Eastern will usually be processed the following business day. For U.S. destinations, we can guarantee delivery before Christmas for all orders placed by December 10. Domestic orders placed December 11 or later may still arrive in time (we’ll be doing our best to get everything sent out quickly), but after December 10 only those orders which request Expedited Shipping can be guaranteed on-time. We also recommend using Expedited Shipping if you need your items to arrive by an earlier date (for a holiday party, Hannukah, etc.). Expedited orders placed by 2 p.m. Eastern will ship on the same day. For orders shipping outside of the U.S., unfortunately we aren’t able to guarantee delivery time (it’s in the hands of the postal service, which does slow down around this time of the year), but we’d recommend ordering sooner rather than later, and we’ll be working hard to get your package in the mail as quickly as we can! We offer a money-back guarantee on every item in our shop. To return merchandise for any reason within 30 days of purchase, for either refund or exchange, simply contact Customer Service at the phone number/email address above to arrange a no-hassle return. If arranging an exchange for merchandise that is not damaged or defective (such as needing a different T-shirt size), we do ask that the customer cover additional shipping costs. Thanks for shopping with Backstreet Records! This CD is in stock now. A 2LP vinyl set is expected in July, which we'll make available for pre-order shortly. "I felt a bit guilty about having walked away from Little Steven the artist," says Steven Van Zandt. "I left that part of myself behind and I shouldn't have done that. I let the material down by not continuing to perform it.... I betrayed the work and I want to fix that. I didn't give up on the material -- there were a lot of other factors -- but I do have a sense of wanting some redemption for it." Enter Soulfire, Stevie's sixth solo album and his first in close to two decades. The album sees the Rock and Roll Hall of Famer revisiting songs that span the length of his career as artist, performer, producer, arranger, and songwriter, focusing directly on the hugely influential "soul horns-meet-rock 'n' roll guitars" approach he first pioneered on Southside Johnny and the Asbury Jukes' classic first three albums. In fact, Soulfire includes four of Stevie's songs that originally appeared on Jukes albums: "I'm Coming Back," "Some Things Just Don't Change," "Love on the Wrong Side of Town" (co-written with Bruce Springsteen), and "I Don't Want to Go Home." "I've always been very thematic with my work, very conceptual," Steven says. "I need a big picture, I can't just do a collection of songs, that doesn't work for me. In this case, the concept became me. Who am I? I'm kind of my own genre at this point. So I tried to pick material that when you added it all up, really represented me. So there are a couple of covers, a couple of new songs, and some of what I feel are the best songs I've written and co-written over the years. This record is me doing me." 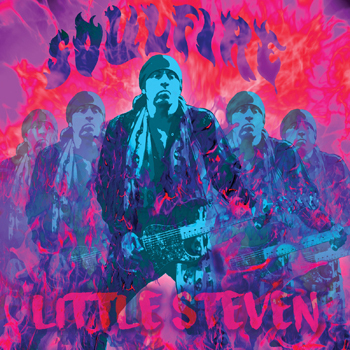 Soulfire was arranged and produced by Van Zandt at his own Renegade Studios in New York City. It was co-produced and recorded by Geoff Sanoff, and co-produced and music directed by guitarist Marc Ribler. (Ribler was recruited by Stevie as Darlene Love's music director for 2015's Van Zandt-produced Introducing Darlene Love and then "borrowed back" to serve that same role with The Disciples of Soul.) Background vocals on "I Don't Want To Go Home" and "The City Weeps Tonight" come courtesy of renowned a cappella group, The Persuasions. Soulfire was mixed and mastered by Van Zandt's career-long collaborators and friends Bob Clearmountain and Bob Ludwig. "This was the most fun I've ever had making a record," Van Zandt says. "We did it quickly, while we still had the fire and energy from the  London show. We just took it into the studio and banged it out, six weeks from start to mix. It's one of those strange things, it really seems like it was meant to be."